I’ve been working with a small group to come up with strategies that will help faculty and their institutions respond to challenges to academic freedom. These challenges aren’t particularly new, but things move at the speed of Twitter, and so these challenges have increased and seem to follow a pattern, a professor (often but not always a member of an underrepresented minority) offers a comment on some controversial issue using unflinching rhetoric, and the rhetoric is used by different groups to pressure university administrators to discipline or fire the faculty member. The Steve Salita case is the one many of us know about. The reaction to these challenges tend to be performative–strongly worded letters of support, petitions, and, sometimes hashtags. Those are all well and good, but, as Tressie McMillan Cottom sighed on a Twitter, we need to do more than this. I wrote about social media in Written/Unwritten and in a special journal issue of the CLAJ, but I’ve felt helpless as I’ve seen the uptick in attacks. So I asked a group of people I trust and admire to help me think about what the academy and academics can do, particularly in this current moment when the stakes are so high. I’ve been working with Jessie Daniels, Kim F. Hall, Laura Jones, and McMillan Cottom to work out what those institutions and their faculty need. I’ve been happy to find that groups of people across multiple disciplines are doing similar work. Here is the first part of our work–a list I’m sure will need revision as we learn more. Next up: advice for, well, everyone. of University Professors. AAUP, 1970. McMillan Cottom, Tressie. Everything But The Burden: Publics, Public Scholarship, And Institutions. — Academic Outrage: When The Culture Wars Go Digital. Zevallos, Zuleyka. Protecting Activist Academics Against Public Harassment. —Sociology of Public Harassment Prevention Policies. Allred, Kevin. “Trump’s Weaponized Base Is Going After Academics–I Know Because I Was Targeted.” The Establishment. Daniels, Jessie and Arlene Stein. “Protect Scholars Against Attacks From the Right.” Inside Higher Ed. Kamola, Isaac A. “Crashing the Academic Conversation.” The Chronicle of Higher Education (paywalled). Morris, Catherine. “Professor Durden’s Firing Highlights Adjuncts’ Shaky Footing.” Diverse Issues in Higher Education. Strauss, Valerie. “New Conservative ‘Watch List’ Targets Professors for Advancing ‘Leftist Propaganda’.” Washington Post. West Savali, Kirsten. “For Black Scholars at PWIs, Speaking Truth to Power on Social Media Can Be ‘Professional Suicide.’” The Root. Zeiser, John W.W. “Don’t Expect Liberalism to Come to the Defense of Keeanga-Yamahtta Taylor.” Los Angeles Review of Books. Bilgrami, Akeel, and Jonathan R. Cole, eds. Who’s Afraid of Academic Freedom? New York: Columbia UP, 2015. Print. Carvalho, Edward J., and David B. Downing, eds. Academic Freedom in the Post-9/11 Era. New York: Palgrave/Macmillan, 2010. Print. Cloud, Robert C. “Keyishian v. Board of Regents.” Education Law. N.p., n.d. Web. 13 Mar. 2015. “Committee A Statement on Extramural Utterances.” 1964. Rev. 1989. AAUP Policy Documents and Reports. 10th ed. Washington: AAUP, 2006. 32. Print. Daniels, Jessie, and Joe R. Feagin. “The (coming) social media revolution in the academy.” Fast Capitalism 8, no. 2 (2011). Hofstadter, Richard, and Walter P. Metzger. The Development of Academic Freedom in the United States. New York: Columbia UP, 1955. Print. McMillan Cottom, Tressie. “Who Do You Think You Are?”: When Marginality Meets Academic Microcelebrity. Ada: A Journal of Gender, New Media, and Technology, No.7. Marwick, Alice E. “I tweet honestly, I tweet passionately: Twitter users, context collapse, and the imagined audience.” New Media & Society 13, no. 1 (2011): 114-133. Menand, Louis, ed. The Future of Academic Freedom. Chicago: U of Chicago P, 1996. Print. Matthew, Patricia A. “Tweeting Diversity: Race and Tenure in the Age of Social Media” in Written/Unwritten: Diversity and the Hidden Truths of Tenure. Patricia A. Matthew ed, Chapel Hill: UNC Press, 2016. Print. Nelson, Cary. No University Is an Island: Saving Academic Freedom. New York: New York UP, 2010. Print. “Ramifications of the Supreme Court’s Ruling in Garcetti v. Ceballos.” Modern Language Association. MLA, Feb. 2010. Web. 13 Mar. 2015. http://www.mla.org/garcetti_ceballos. Schrecker, Ellen. The Lost Soul of Higher Education: Corporatization, the Assault on Academic Freedom, and the End of the American University. New York: New, 2010. Print. ___, Ellen. 2010. “The Roots of Right-Wing Attacks on Higher Education.” The NEA Higher Education Journal: 71–82. Shavisi, Arianne. 2015. 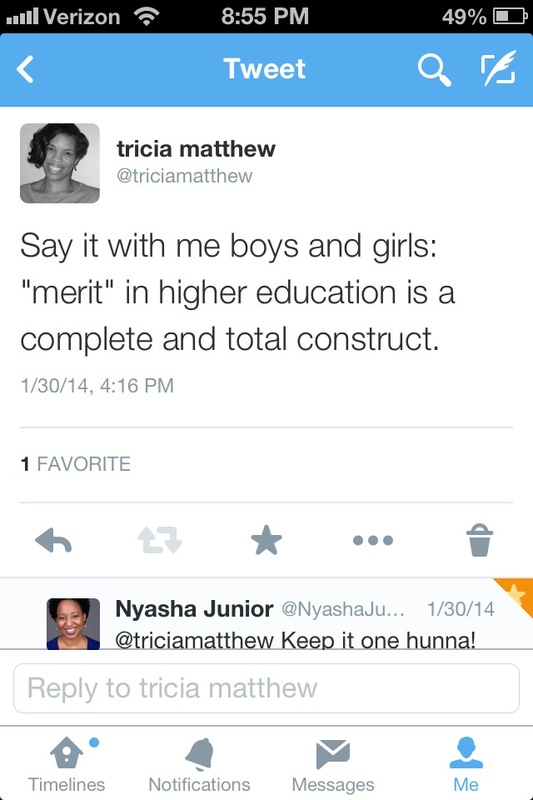 “Epistemic Injustice in the Academy: An Analysis of the Saida Grundy Witch Hunt.” Academe Blog, May 20. Tufecki, Zeynep ““Not This One” Social Movements, the Attention Economy, and Microcelebrity Networked Activism.” American Behavioral Scientist 57.7 (2013): 848-870. I was put the finishing touches on the introduction to the collection when I saw an article in the June 1st New York Times that gave me chills. It’s about how the already financially beleaguered university systems in California (University of California, California State University, and the community colleges) are facing even more budget cuts if the governor’s tax plan is not passed by voters. More than being upset by her rant (she has virtually no institutional power and I figured she’d be held to sharp account for being careless and unthinking), I viewed it as an id-ridden version of more muted resistances to ethnic studies. It seemed to me an expression of the attitudes that threaten the stability of ethnic studies and, by extension, a pretty large swath of faculty of color by people who do have institutional power: faculty who vote on what kind of specialists to hire, personnel committees, deans, provosts, etc. Jon Coupal, the president of the Howard Jarvis Taxpayers Association, which strongly opposes the proposed tax increase, said the colleges should do more to show they are cutting spending, like reducing pay for top administrators or closing programs that do not directly benefit the state. Almost everything about the statement is anxiety producing. Proposition 218 is a major measure with significant implications for local governments, property owners, businesses, and California residents. The measure would restrict local government’s ability to raise most forms of revenue. This restriction would result in lower payments by individuals and businesses to local government–and less spending for local public services. Proposition 218’s (1) requirement that many existing fees, assessments and taxes be recalculated and submitted to a vote, (2) expansion of the initiative powers, and (3) shift of burden of proof in lawsuits challenging fee and assessment amounts all serve to increase local residents’ direct control over local government finances, but decrease the certainty in local government finance. That statement should make anyone who cares about diversity in higher education–in the composition of the faculty and in its curriculum very nervous. “Directly benefit the state” is the kind of language that all humanities professor should be nervous about. It’s the kind of language that led to the dismantling of several humanities departments at the State University of New York, Albany. “Programs based on politics” is usually code for ethnic studies, women’s and gender studies, and GLBT studies. He is describing the late 60s and early 70s, a time that marks the rise of Black Studies. This notion of utility is cropping up again, and this time the protests will happen in the voting booth, at a time when the country is particularly anxious about anything that reflects, represents, or refers to race. It’s become fashionable to call for the end of tenure, to claim that it is costly, doesn’t actually result in “intellectual freedom” and rewards unproductive faculty who atrophy after they reach this professional milestone, hanging up their scholarly and pedagogical hats and easing into inertia. Most of the people arguing for its abolition are white. And tenured. Given that faculty of color are disproportionally clustered among the contingent ranks, most of the people who work without the security and benefits of tenure are not white. There’s something wrong with the math here and there is definitely something wrong with this picture. Just look at the pictures of the five-person panel The New York Times assembled for one of its “Room for Debate” virtual roundtables to take up the question “What if College Tenure Dies?” The debate held only passing interest to me when it was first published, but it came to mind with the recent death of the brilliant Derrick Bell. Bell is famous for, among other things, being fired from Harvard after he protested the lack of women of color on the law faculty. At the time he was the Weld Professor of Law and could easily have rested on his laurels, but rather than bend, rather than yield he pushed back. Or, to be more precise, he refused to come back at the end of his sabbatical until Harvard addressed this deficit. Considered a foundational voice in Critical Race Theory, Bell is the author of And We Are Not Saved: The Elusive Quest for Racial Justice (1987) and Faces at the Bottom of the Well: The Permanence of Racism (1992). Students who sat in his lectures and seminars speak of him in worshipful tones, and in the days after his death, I couldn’t look at my twitter feed, my facebook page, or my favorite blogs without seeing someone mourning his passing. I know Bell primarily for his work in Critical Race Theory, but given what I’m steeped in these days, I couldn’t help but see his passing in the context of the current debates about the role of tenure in the twenty-first century academy. I know we live in an age when rhetorical thunderbolts abound, but it makes me queasy to see an intellectual, especially one firmly and safely ensconced in the academy, doing the dirty work for administrators who are all too willing to use economics as a way to explain why they are doing away with tenure lines and replacing those positions with the cheap labor that is contingency faculty. It’s particularly galling to have that thunderbolt from a scholar who I am sure is costing Columbia a pretty penny. I could go on about all the ways in which Taylor is wrong—particularly when it comes to thinking about how tenure makes it possible for institutions of all kinds to meet their obligations to society—but what really sticks out in light of Bell’s passing is the kind of diversity that will be left unprotected if tenure is abolished. Bell and others like him represent an ideal kind of diversity that wise, ethical, and long-sighted academics would be wise to protect. Bell embodies what I’m calling double diversity. It is the opposite of the diversity ethos that I fear pervades humanities departments today–simple, crude diversity that tends to reduce faculty to their race, ethnicity, gender, or sexuality. It’s the approach that has a department saying something like, “we need a Hispanic person” and then putting out an ad for Latino/a studies, conflating the scholar (and the scholarship) with someone’s identity. Double Diversity doesn’t just mean hiring brown faces or teaching texts by colored folks. Instead, it acknowledges that the academy works best when different teaching models, different research questions, different interactions with the world are equally valued and preserved. I’ve been an academic of some sort for more than fifteen years, and this terror is what guides many decisions in the humanities from admissions decisions to how job advertisements are written to hiring and retention practices. Given that those who rise to power tend to be those who subscribe to the “universal values and criteria” model of what is and isn’t “good” scholarship, it behooves the rest of us to push as hard as possible to protect scholars whose scholarship aims to stretch the academy’s rigid boundaries. The tension in the academy is often between the old and the new. So, while scholars and administrators alike claim they value new contributions to scholarship, often “new” actually only means a slight variation of what people in positions of authority view as acceptable. Anyone invested in whole new areas of scholarship or new ways of engaging with old areas of criticism needs the protection that comes with tenure. It goes too far to say that the most diverse academics I know are people of color. That’s a generalization too broad to make, but I know what I see and I see it because I move in a world of academic/activists of color, and the truth of it is even those who may have been intellectually trained in the most traditional of methodologies always occupy two worlds, and fact of this truth means that we bring a double-view to the table. This, in turn, means that we have learned to look at whatever is in front of us from texts to statistics to students with a complexity that benefits the academy in myriad ways. 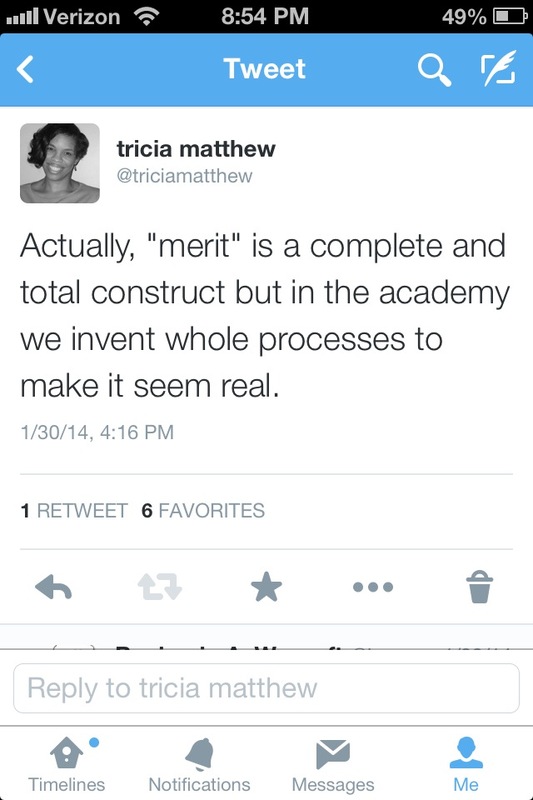 And the only way to insure that the academy doesn’t fold in under the weight of sameness is to protect us with tenure. Tenured, I don’t think we atrophy. I know we blossom. This suggests that the problem isn’t with tenure but with those who abuse its privileges, and, cynic though I am, I believe those are more the exception than the rule. I can’t help but think that those who seek to abandon tenure, whether they realize it or not, are pulling up rather than letting down the ropes, and I worry that if they succeed future Derrick Bells will be left at the bottom of the well. While I’m sure there are colleagues, departments, and schools that are astonishingly backwards about issues of race, I suspect the exceptionally advanced view that faculty of color have about the topic makes it difficult to judge what “backwards” really is; or, to put it another way, it’s all relative. Maddening and disturbing but relative. Perhaps the most jarring part of the transition from graduate school to full-time employment is that we’ve left behind people (of all hues) who share, on a deep level, our attitudes about race, diversity, and ethnicity. The dry, gallows humor that bounced around conversations over drinks in graduate school as we coped with racism in all its forms can hit a false note with new colleagues who may or may not share our sensibilities about an issue that is more controversial than we realize. Over the time it takes to finish the doctorate, we are drawn to people who “get it” and shy away from those whose colorblindness make them annoying or downright difficult. Our search for people who share our ideas and sensibilities about issues related to race often moves us outside of our departments and colleges. We develop a shorthand to talk about the realities of racism and our cultural quirks. Yes, we know that there are racial minefields to be navigated, but we have a built support group to help us step carefully and to comfort us when things blow up. We choose our dissertation advisors and committee members. We attend conferences and share our work with largely sympathetic audiences. We narrow our world to those scholars, professors, and friends who reflect our worldview back to us. And while we know that the academy is not some rainbow-colored love fest, we don’t always realize how much we’ve shaped the world to suit us. This is especially the case once we move out of our course work and can, generally speaking, choose who we spend our time with 90% of the time. We choose our dissertation advisors and committee members. We attend conferences and share our work with largely sympathetic audiences. We narrow our world to those scholars, professors, and friends who reflect our worldview back to us. When we encounter people who disagree with us, especially about our research, it can be jarring but there is still some common ground underneath that intellectual tension. I don’t mean to portray this period as idyllic. Sexism, homophobia, and good old fashioned, universal jealousy are ever present. But we know who we know, who our friends are, who we should avoid, and where to turn when things go pearshaped. All of that fades away when we join a department. Perhaps there are other people of color in the department, and, if you’re lucky, you can connect. But this isn’t always the case. And while you might find allies among white colleagues, it’s a long process to know who really gets it, and, in the common parlance, who will have your back. Every new faculty member has to make this transition, but there’s an added layer of personal vetting that goes both ways for faculty of color. When moments of casual racism occur, it’s not entirely clear whom we can turn to for comfort, guidance, or just a bit of a rant. Your colleagues are trying to figure out how you will move as a person of color in their professional world, and you are trying to suss out whom among your colleagues you can trust. In some instances, we’re not only called upon to justify our specific research agendas but see our whole fields (especially those who work in ethnic studies) subject to skepticism. In practical terms, this can be the difference between courses that are required and courses that are considered electives. I think that things are better now, perhaps. All of the ways we have of keeping in better touch with one another means that we don’t have to leave our grad school cohorts behind, but the hallways of a new department can be incredibly isolating and the stakes are unbelievably high. Although Dr. Goswami is a recipient of the coveted excellence in teaching award at Depaul, and has superb teaching evaluations, colleagues in the Department of Philosophy took great pains to scrutinize the intent of students who had evaluated her, going as far as to raise questions about why her student’s reactions were so positive. This is something that is not customary in the department.